A bowl of Green goodness! This seems like such a random blog post for me because I don’t typically post my random cravings or thoughts. Lol. 🙂 So here it is – not that this is really even a “recipe” per se, just something I threw together in the madness. Well I guess it is an example of how I eat sometimes on a whim. The level of “busy” has really kicked up times 10 it feels like – work, School, Kids, Kids School and Activities, helping my husband edit his latest book and don’t forget being an awesome wife (toot-toot, yeah that’s me tooting my own horn, lol). With that said I’ve been doing a lot of meal prep the night before or on my lunch break from work. An example of this would be, Sunday into Monday I soaked black beans overnight then cooked them the next day, so Monday night and Tuesday we ate black bean burritos for dinner. I was on the run with class so I needed something quick and on the go. Our schedules don’t sound all that bad with a little planning. Last night I made vegan Sloppy “Joes” for the kids and Seth had a big salad and soup. I didn’t eat until after coming home from Jasmine’s cheer practice (I had a late lunch) so I just threw this together. Again an example of something I throw together and enjoy on the fly. I lightly sautéed the Kale in olive oil (I just did a couple turns of olive oil in the pan) just before it wilts. 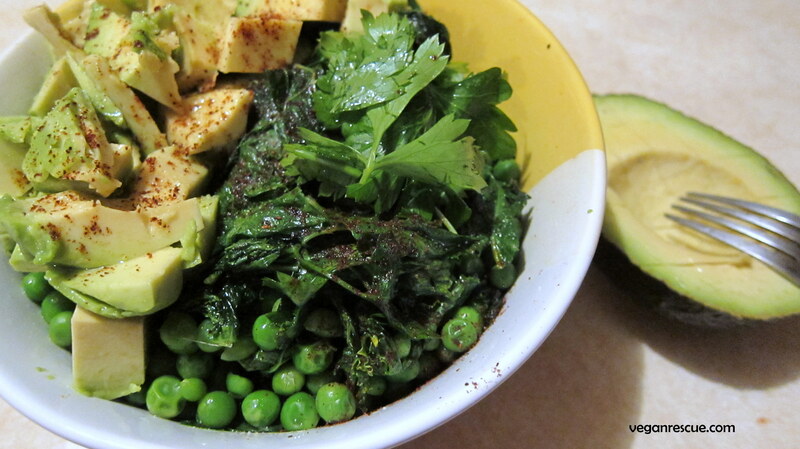 I tossed in the steamed peas, fresh parsley and chopped avocado then seasoned to taste. Yummy in my tummy! Weird craving…but I love peas! Love Kale! and Love love Avocado – so why not throw them all together, right! Enjoy! This looks divine! I need to sautee kale more often!